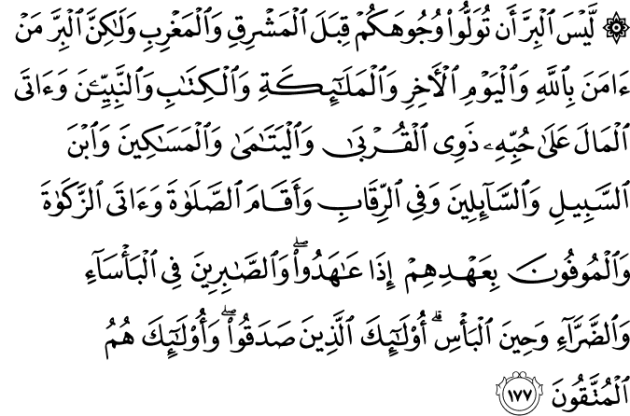 This Ayah contains many great wisdoms, encompassing rulings and correct beliefs. Abu Al-`Aliyah said, “The Jews used to face the west for their Qiblah, while the Christians used to face the east for their Qiblah. Certainly, those who acquire the qualities mentioned in the Ayah will have indeed embraced all aspects of Islam and implemented all types of righteousness; believing in Allah, that He is the only God worthy of worship, and believing in the angels the emissaries between Allah and His Messengers.The `Books’ are the Divinely revealed Books from Allah to the Prophets, which were finalized by the most honorable Book (the Qur’an). (Sadaqah (i. e., charity) given to the poor is a charity, while the Sadaqah given to the relatives is both Sadaqah and Silah (nurturing relations), for they are the most deserving of you and your kindness and charity).Allah has commanded kindness to the relatives in many places in the Qur’an. (to the orphans) The orphans are children who have none to look after them, having lost their fathers while they are still young, weak and unable to find their own sustenance since they have not reached the age of work and adolescence. The Prophet said: The Miskin is the person who does not have enough food, clothing, or he has no dwelling. So the Miskin should be granted the provisions to sustain him enough so that he can acquire his needs. (and to the wayfarer) is the needy traveler who runs out of money and should, thus, be granted whatever amount that helps him to go back to his land. Such is the case with whoever intends to go on a permissible journey, he is given what he needs for his journey and back. The guests are included in this category. (and to those who ask) refers to those who beg people and are thus given a part of the Zakah and general charity. (and to set servants free) These are the servants who seek to free themselves, but cannot find enough money to buy their freedom. Allah’s statement: (performs As-Salah (Iqamat-As-Salah)) means those who pray on time and give the prayer its due right; the bowing, prostration, and the necessary attention and humbleness required by Allah. Allah’s statement: (and gives the Zakah) means the required charity (Zakah) due on one’s money, Allah’s statement: (and who fulfill their covenant when they make it,)is similar to: (Those who fulfill the covenant of Allah and break not the Mithaq (bond, treaty, covenant).) (13:20). Allah’s statement:(. ..and who are patient in extreme poverty and ailment (disease) and at the time of fighting (during the battles).) means, during the time of meekness and ailment. (…and at the time of fighting (during the battles).) means on the battlefield while facing the enemy.And calling them the patient here, is a form of praise, because of the importance of patience in these circumstances, and the suffering and difficulties that accompany them. Allah’s statement:(Such are the people of the truth) means, whoever acquires these qualities, these are truthful in their faith. This is because they have achieved faith in the heart and realized it in deed and upon the tongue. So they are the truthful, (and they are Al-Muttaqun (the pious).) because they avoided the prohibitions and performed the acts of obedience.